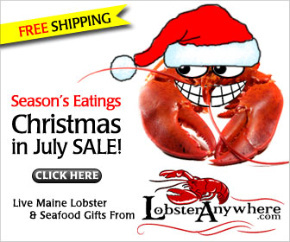 Your source for Maine Lobsters - Where to buy them, how to cook and eat them! Maine lobster is one of the greatest treats for any sea food lover, and if you like to eat seafood you know that no other lobster compares. With this website we hope to connect you with some of the best resources online regarding Maine lobster. Also visit our free page of lobster recipes. If you are in the Waterville - Winslow Maine area, don't overlook the "Lobster Trap" restaurant. In Wiscasset, don't leave without a world famous "Red's Eats" Lobster Roll made with the meat from a FULL one-pound lobster! So take a look around. Here you'll find humor, helpful and interesting lobster information, and a whole lot more. If you came here looking to buy lobster, you found the right place! We are compiling the most comprehensive listing of Maine Lobster distributors on the web! This is a rare kind of food that you can only describe unless you have tasted it. Many people can tell a big difference between a Maine lobster and other lobsters. If the taste doesn't it do it, the looks sure will. We all know why we love our lobster from the state of Maine! Read our Lobster F.A.Q. page to read answers to many questions about Maine lobsters, and find more lobster information than you would ever expect in one source. Visit our lobster recipes page for a nice, but not overwhelming selection of hand picked lobster recipes, including a recipe for the BEST lobster roll in the world! Learn where to BUY Maine lobsters, how to cook them on another page...and how to eat them on yet another! And because we're online, you won't have to worry about getting lobster juices on the pages! And if you're intrigued about what advertising on our super high traffic site will do for your lobster or seafood related business, visit us here. Where to buy, how to eat, how to make the perfect lobster roll! Check out these sites while you're here!